President-elect Nayib Bukele was a social media candidate for office with legions of followers on Twitter and Facebook. Now that he is preparing to take office, Bukele has continued to use Twitter as his primary method of communicating with the country. You can always check out what he has to say @NayibBukele. Regarding the announcement of President @realDonaldTrump to suspend aid to El Salvador, we hope that it will resume and even increase on the entrance of our new Government. So far, all of our projects have been accompanied [by the US] and there is a lot of enthusiasm for the change in our country. The tour of the president elect was a total success. The president elect was sending signals that he wishes to prioritize the relationship with the United States and we are giving the same signal that we want to revive and strengthen the bilateral relation. Una manzana le costó al FMLN, la Presidencia, el Gobierno, 20 alcaldías, diputados, más de un millón de votos y su existencia como partido político relevante. Ahora, probamos que esa manzana ni siquiera existió. Gracias a Dios. Por todo. An apple cost the FMLN the presidency, the government, 20 mayor's offices, deputies, more than a million votes and its existence as a relevant political party. Now we are proving this apple never even existed. Thanks to God. For everything. El pacto ARENA-FMLN cruza líneas ideológicas, desacuerdos históricos y 100,000 vidas humanas, porque está cimentado en la protección de sus corruptos. Juntos controlarán dos poderes del Estado, aún después del 1 de junio. Sus seguidores deberían empezar a cambiar sus himnos. The ARENA-FMLN pact crosses ideological lines, historic disagreements, and 100,000 human lives because it is founded on the protection of the crooked. Together they will still control two branches of the government, even after June 1. Their followers ought to begin to change their anthems. Ya en serio, ¿cuántas veces tiene Hugo Martínez que decir que NO quiere un trabajo en el Gobierno, para que le ofrezcamos uno? Seriously -- how many times does Hugo Martinez have to say that he does not want a job in the government so that we offer him one? Bukele's twitter feed is also carrying on a running dispute with Norman Quijano, president of the National Assembly, over the location and content of Bukele's inauguration ceremony (which now appears settled for Plaza Barrios in the renovated historic center of San Salvador) and also carries the typical pictures of meetings with ambassadors and representatives of international financial institutions. Bukele has also been tweeting on policy questions being debated in the National Assembly, supporting pensions for teachers, soldiers and police, opposing private interests on a governing water authority, and opposing a proposed new amnesty law. China comete un grave error al invitar, en esta coyuntura, a los diputados a visitar su país en un viaje oficial. Las decisiones de política exterior las toma el Presidente y esta movida diplomática solo demuestra su desconocimiento de cómo funciona nuestro país. China makes a serious mistake by inviting, at this juncture, the deputies to visit their country on an official trip. Foreign policy decisions are made by the President and this diplomatic move only demonstrates their ignorance of how our country works. And as noted in an earlier post, Bukele has gone as far on Twitter as to demand that the National Civilian Police release student protesters within two hours or face future proceedings after June 1. The tweets of the president-elect often feel like he is still on the campaign trail. 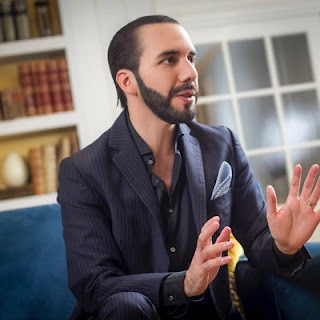 Bukele clearly intends to use social media to rally pressure against obstacles he will face in the National Assembly and elsewhere in the government. You can assume that we will be quoting many more tweets in the weeks and months to come.